La méditation de pleine conscience (ici, attention focalisée non réactive qui revient sur les sensations de la respiration aux narines, à l’abdomen) peut réduire l’intensité et l’aspect désagréable de la douleur. Dans cette expérience, l’intensité a été réduite de 40% et le caractère désagréable de la sensation de 57%. Cet article de recherche (en anglais) présente l’activité des aires cérébrales associées à la réduction de l’intensité de la douleur et de l’aspect désagréable des sensations vécues. The subjective experience of one’s environment is constructed by interactions among sensory, cognitive, and affective processes. For centuries, meditation has been thought to influence such processes by enabling a nonevaluative representation of sensory events. To better understand how meditation influences the sensory experience, we used arterial spin labeling functional magnetic resonance imaging to assess the neural mechanisms by which mindfulness meditation influences pain in healthy human participants. pain intensity ratings by 40% when compared to rest. A two-factor repeated-measures ANOVA was used to identify interactions between meditation and pain-related brain activation. Meditation reduced pain-related activation of the contralateral primary somatosensory cortex. Multiple regression analysis was used to identify brain regions associated with individual differences in the magnitude of meditation-related pain reductions. Meditation-induced reductions in pain intensity ratings were associated with increased activity in the anterior cingulate cortex and anterior insula, areas involved in the cognitive regulation of nociceptive processing. Reductions in pain unpleasantness ratings were associated with orbitofrontal cortex activation, an area implicated in reframing the contextual evaluation of sensory events. Moreover, reductions in pain unpleasantness also were associated with thalamic deactivation, which may reflect a limbic gating mechanism involved in modifying interactions between afferent input and executive-order brain areas. Together, these data indicate that meditation engages multiple brain mechanisms that alter the construction of the subjectively available pain experience from afferent information. in The Journal of neuroscience. Zeidan, F., Martucci, K. T., Kraft, R. A., Gordon, N. S., Mchaffie JG., & Coghill RC. (2011). Brain mechanisms supporting the modulation of pain by mindfulness meditation. J Neurosci, 31(14), 5540–5548. « Mindfulness-based mental training was carried out in four separate, 20-minute sessions conducted by a facilitator with over ten years of experience leading similar meditation regimens. Subjects had no prior meditative experience and were informed that such training was secular and taught as the cognitive practice of Shamatha or mindfulness meditation. Each training session was held with one to three participants. On mindfulness meditation training day 1, subjects were encouraged to sit with a straight posture, eyes closed and to focus on the changing sensations of the breath occurring at the tips of their nostrils. Instructions emphasized acknowledging discursive thoughts and feelings and to return their attention back to the breath sensation without judgment or emotional reaction whenever such discursive events occurred. On training day 2, participants continued to focus on breath-related nostril sensations and were instructed to “follow the breath,” by mentally noting the rise and fall of the chest and abdomen. The last ten minutes were held in silence so subjects could develop their meditative practice. On training day 3, the same basic principles of the previous sessions were reiterated. However, an audio recording of MRI scanner sounds was introduced during the last ten minutes of meditation to familiarize subjects with the sounds of the scanner. On the final training session (day 4), subjects received minimal meditation instruction but were required to lie in the supine position and meditate with the audio recording of the MRI sounds to simulate the scanner environment. Contrary to traditional mindfulness-based training programs, subjects were not required to practice outside of training. Subjects also completed the Freiburg Mindfulness Inventory short-form (FMI), a 14-item assessment that measures levels of mindfulness, before psychophysical pain training and after MRI session 2. The FMI is a psychometrically validated instrument with high internal consistency (Cronbach alpha = 0.86) (Walach, 2006). Statements such as “I am open to the experience of the present moment” are rated on a 5-point scale from 1 (rarely) to 5 (always). Higher scores indicate more skill with the mindfulness technique. One might also argue that meditation’s pain-relieving effects are simply due to divided attention rather than any unique attributes of mindfulness meditation per se. We believe, that this explanation is unlikely, as it fails to incorporate the differences in the mental processes involved between the two. For example, mindfulness meditation requires both the active allocation of attentional processes and the acknowledgment/regulation of responses to discursive stimuli. By contrast, divided attention likely lacks this meta-cognitive component. When compared to the divided attention condition, meditation was more effective at reducing pain ratings and evoking greater brain activation in areas involved in the cognitive/affective modulation of pain. Distraction has been found to reduce pain-related activity in the mid-ACC and AI (Bantick et al., 2002). In contrast, we found that increases in these areas were directly related to pain modulation. Moreover, in studies directly comparing meditation to distraction, meditation reduced pain ratings more than distraction (Sedan et al., 2010b)and activated emotion regulatory brain regions (PFC, ACC) to a greater extent than distraction (Holzel et al., 2007). Mindfulness meditation is characterized by two distinct cognitive practices. The fundamental practice of mindfulness is called focused attention (Lutz et al., 2008) or Shamatha (Sanskrit translation: calm abiding) (Wallace, 2006). Focused attention promotes a sense of detachment from ongoing affective states and enhances cognitive control (Maclean et al., 2010; Zeidan et al., 2010c). Traditionally, focused attention is cultivated as a prerequisite to another form of mindfulness meditation labeled open monitoring(Lutz et al., 2008)or Vipassana (Sanskrit translation: insight into the nature of reality)(Wallace, 2006). Open monitoring practitioners commonly refer to mindfulness as a moment-to-moment non-evaluative awareness of “whatever arises” (Wallace, 2006). The present findings, therefore, are distinct from open monitoring’s effects on pain. In open monitoring, meditators are taught to fully experience the intensity of a sensory event. Consistent with this, open monitoring has been found to reduce pain unpleasantness, but not pain intensity ratings (Brown and Jones, 2010; Perlman et al., 2010). Thus, focused attention may attenuate pain by altering the elaboration of nociceptive information to pain, whereas open monitoring promotes a non-evaluative stance to a fully experienced sensory event. Although the benefits of meditation have long been associated with extensive training (Grossman et al., 2004), our findings demonstrate that some of meditation’s beneficial effects can be realized after just four-days (20 min/day) of training, suggesting that it may serve as an effective adjunct therapy in clinical settings. However, it is highly unlikely that the qualitative experience of meditation is similar across expertise level. In fact, studies have shown a positive relationship between meditative experience and pain relief (Grant et al., 2010, Brown & Jones, 2010) suggesting that the benefits of this technique can be further realized after extensive training. Nevertheless, we found that the increased capacity to reliably focus on the breath in a non-evaluative manner following brief training can effectively reduce the subjective experience of pain. Because meditation likely alters pain by enhancing cognitive control and reframing the contextual evaluation of nociceptive information, the constellation of interactions between expectations, emotions, and cognitive appraisals intrinsic to the construction of the sensory experience can be regulated by the meta-cognitive ability to non-judgmentally sustain focus on the present moment. Pain. 1994 Feb;56(2):217-26. 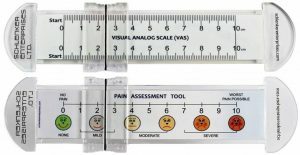 A comparison of pain measurement characteristics of mechanical visual analogue and simple numerical rating scales. Price DD1, Bush FM, Long S, Harkins SW.